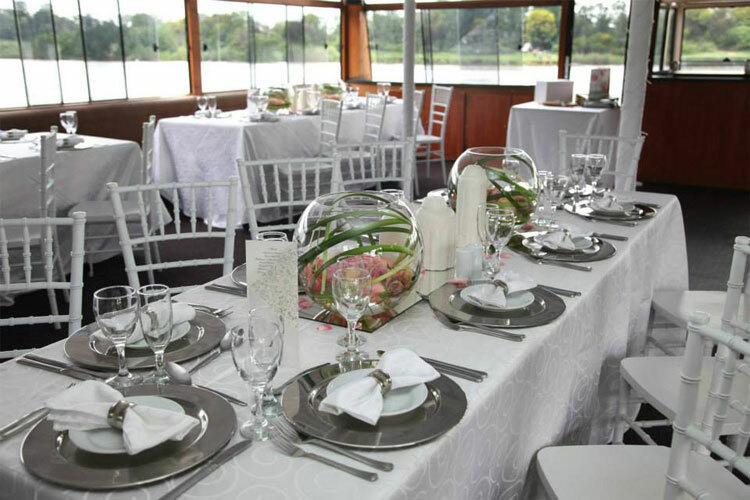 If you are searching for a dream Vaal River wedding venue, look no further than Liquid Lounge – an exclusive wedding venue that cruises down the immaculate Vaal River. Your guests will be astounded by our beautiful wedding venue, a luxurious cruiser fully equipped to satisfy all your wedding requirements. You and your guests will enjoy an intimate and beautiful wedding aboard our popular river cruiser, and will be serviced by professional staff, guaranteeing 100% satisfaction on your special wedding day. Liquid Lounge will manage every detail of your Vaal River wedding, seeing to it that your day runs smoothly without any hassles to stress you out. Relax while we take care of your special day! At Liquid Lounge we understand how important you wedding day is. It is essential to choose a reputable wedding venue in the Vaal, to minimise the risk of any wedding disasters and issues. Let Liquid Lounge take care of all your wedding day needs, from start to “I do”. A Vaal River Wedding Venue such as Liquid Lounge offers so many photo opportunities for the photographer. The beautiful natural scenery as a backdrop for your wedding photos will serve for some unique wedding pictures! You and your guests will feel relaxed while enjoying the beauty that nature has to offer – Book your Vaal River Wedding Venue with Liquid Lounge, and have the wedding you’ve always dreamed of! The Liquid Lounge Vaal River wedding venue will depart from The Riverside Hotel in Vanderbijlpark, located on the river banks. You have the option of a beautiful garden ceremony at the hotel, which makes for lovely wedding photography and bridal party shoots. Our wedding setups are done by a professional Vaal wedding décor company, and you are welcome to add or remove items to suit your needs. Packages are also very affordable, making your dream wedding one step closer! Book your dream river wedding with Liquid Lounge! Our Vaal River Wedding Venue is very popular, and it is advised to book your special day well in advance to ensure you get the date you want. View our website gallery for wedding setup pictures and ideas of what your wedding reception could look like. We also have wedding packages and pricelists available for you to download. Should you require any additional information, or would like to make an appointment to see our cruisers, contact us! 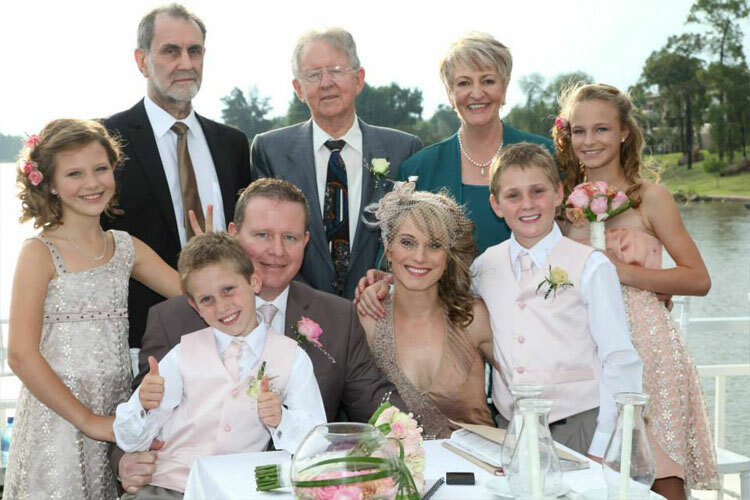 Our friendly and professional staff will ensure you feel at ease regarding your Vaal River wedding arrangements. 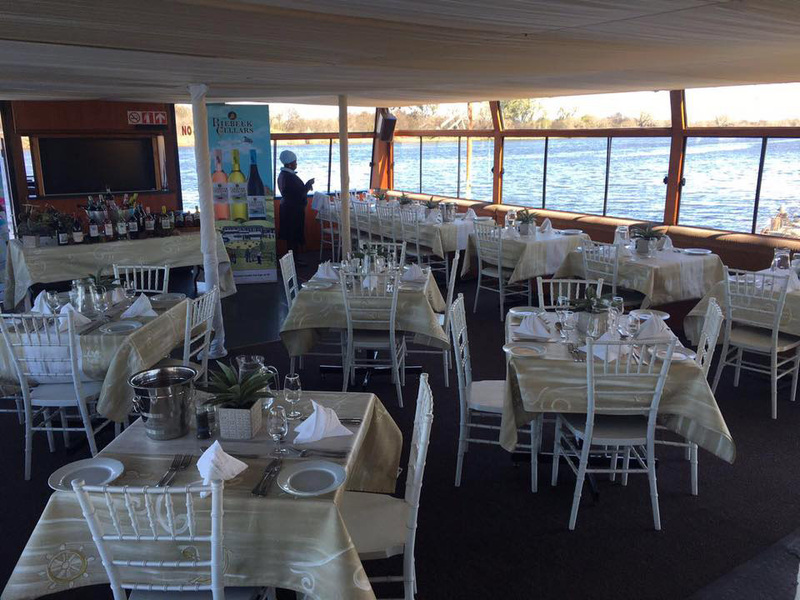 Treat yourself and your guests to a river cruise: What better wedding venue that one that cruises down the beautiful Vaal River! The Vaal River provides a beautiful setting for you to enjoy the company of your guests, creating a very relaxed and enjoyable atmosphere for everyone. Photography opportunities: The beautiful and natural surrounds serves for the perfect backdrop for your wedding pictures. Imagine the tranquil Vaal River pictures in your beautiful wedding album. Catering, drinks, décor and the works: As a well-rounded wedding venue, we will handle everything from the décor setup to preparing the dishes you decided on for your wedding day. Our very capable chefs will ensure that your food is prepared to perfection, adding to your wedding day experience. Guests can enjoy fresh cocktails, and a cash bar is available to them. All the luxurious facilities you will require: Our Vaal River wedding venue features all the facilities you will require for a comfortable cruise. This includes sufficient bathrooms, a dancefloor setup if required and seating arrangements for up to 120 guests. Upper and lower decks to choose from: Guests can use both the upper and lower decks. 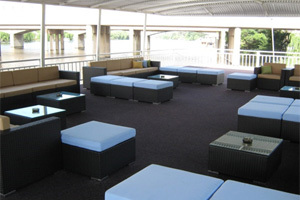 The upper deck offers a very relaxed and unique experience to guests. The lower deck can also be used for more formal setups, depending on the needs of the wedding couple. Talk to our team today to find more about what you have in mind for your wedding day, and we will provide you with a suitable solution. Unforgettable wedding day: All of these aspects together will contribute to a memorable wedding day. You and your guests will truly enjoy your day aboard our luxurious river cruiser, whilst our team takes care of your every need. 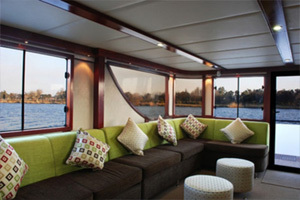 Another offering for your wedding day, is to stay over in our luxurious houseboat, Liquid Living. 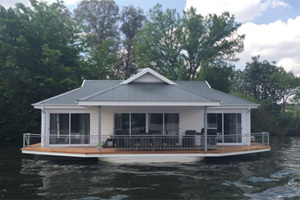 Enquire today to find out if our houseboat is available for your wedding accommodation needs, and enjoy a truly unique stay on the Vaal River after your wedding day. 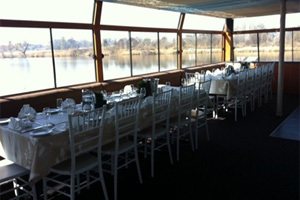 For more information about this Vaal river wedding venue, or our houseboat, talk to us today. Contact the Liquid Lounge about your wedding venue needs, and enquire about our available packages. We will aim to accommodate your requests as far as possible.